Characteristics, Dating of Aboriginal Engravings in the Pilbara.  How Old is the Rock Art of the Burrup Peninsula? Situated in the Pilbara area of Western Australia next to the Dampier Archipelago, the Burrup Peninsula - also known as "Murujuga" meaning "hip bone sticking out" in the Ngayarda language of the peninsula's Jaburara people - is home to one of the largest collections of Aboriginal rock art in the world. Together with Ubirr rock art in the Kakadu National Park, Arnhem Land, Murujuga is a major centre of Aboriginal petroglyphs in Australia and a world-famous site of prehistoric art dating back to the Upper Paleolithic era. The prehistoric rock engravings of Murujuga feature a wide variety of subjects and motifs, including depictions of extinct megafauna such as the Tasmanian tiger (thylacine), and human figures in everyday as well as ceremonial activities. The area also contains a range of aboriginal megalithic art, involving standing stones like the European megaliths (menhirs), as well as circular stone arrangements. In addition to this huge collection of rock art, spread across some 2,300 sites throughout the Burrup Peninsula and the surrounding islands of the Dampier Archipelago, there are numerous middens, artifact scatters, and other caches of aboriginal items. To see how Aboriginal engravings fit into the evolution of cave art in Europe and elsewhere, see: Prehistoric Art Timeline (2.5 million BCE onwards). For a rare but extensive European site of open air petroglyphs, see: Coa Valley Engravings, in Portugal (22,000 BCE). Unfortunately, archeologists can't date rock engravings directly. Unlike cave painting which involves the use of colour pigments and other organic matter - much of which can be dated - engravings leave no organic residue. Furthermore, unlike dateable archeological layers that accumulate within the confines of an underground cave, there is little in the immediate environment of an open-air petroglyph that can be used to indirectly date the work of art itself. The rocks themselves can be dated, in fact recent cosmic radiation tests on engraved rocks at Murujuga indicate an age of 40,000 BCE or older. (But note also that the Pilbara region contains some of the world's most ancient surface rocks, including granites that are at least three billion years old.) However, the age of an engraved rock cannot tell us when the engraving was made. Even where lumps of red ochre pigment have been discovered and dated, it is not possible to be certain that they were used in the creation of pictographs or paintings. This is because both body painting and face painting appears to have been a widespread tradition of aboriginal culture during the Upper Paleolithic. Note: For a comparison with contemporaneous painting in Africa, see the animal pictures on the Apollo 11 Cave Stones (c.25,500 BCE). How Old is the Rock Art of the Burrup Peninsula? Despite the absence of scientific data on the dating of Murujuga's ancient art, archeologists attempt to arrive at a reasonable estimate as to the period within which it might have been created, by looking at factors like weathering patterns, the style and content of the art, evidence of habitation and the use of colour pigments like ochre. In addition, the timing of Stone Age art in other areas of the world must also be an influence. 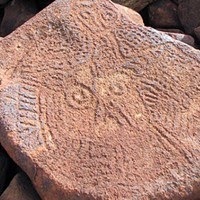 A consideration of these factors, suggests that the oldest art in the Pilbara was created during the era of Paleolithic art, well before the last Ice Age, which occurred around 22,000 years ago. Certainly, given that the earliest human habitation in northern Australia - the Malakunanja II rock shelter - has been dated to about 53,000 BCE, it seems perfectly reasonable to conclude that these early modern humans would have started to paint, draw or engrave pictures by 30,000 BCE. After all, their counterparts in Europe were creating abstract signs and hand stencils on cave walls no later than 39,000 BCE. 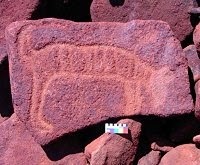 The recent discovery of the Nawarla Gabarnmang charcoal drawing, carbon-dated to 26,000 BCE, puts down a significant marker, but no one yet knows where the earliest art in northern Australia is located, although the Burrup Peninsula or the Dampier Archipelago must be a strong possibility. Kimberley rock art may also prove to be exceptionally ancient, given that its later Bradshaw paintings have been carbon-dated to 15,500 BCE. IMPORTANT NOTE: The recent discovery of Sulawesi Cave art (Indonesia) dating to 37,900 BCE has huge implications for the dating of ancient art in Australia, not least because Sulawesi forms part of the "land-bridge" used by migrants from the Asian continent to Australia. The rock of the Burrup Peninsula and Dampier Archipelago includes a diverse range of igneous rocks, which includes some of the strongest types in Australia, such as granodiorite, dolerite, rhyodacite, quartzdiorite, diorite and granite. Their general hardness accounts for the fact that Burrup Peninsula art is primarily etched or incised into the stone surface, while the artworks of the adjoining Kimberley region mostly involve paintings executed on softer sandstone. The area's rock art has yet to be scientifically counted or classified but it is thought to include as many as one million images. No one knows who first created these images, or whether these artists were direct ancestors of the indigenous Yaburara people, or perhaps an earlier group of visitors to the continent, but Aboriginal people believe in the tradition that the engravings were created by the "marga " - ancestral creator beings - in the Dreaming. At any rate the Burrup peninsula and Dampier archipelago constitute one of the world's most extensive open-air art galleries, as well as an area with enormous ecological, cultural and archeological significance. As a result of considerable pressure from large commercial interests in the gas and mining industries, concerns about the conservation and preservation of the area has led to a campaign for its protection. Since July 2008, the Australian Government has placed 90 percent of the area's rock art sites on the National Heritage List, while the area itself has been placed on the World Monument Fund's list of 100 Most Endangered Places - the only such site in Australia. NOTE: For the finest examples of Aboriginal finger fluting in Australia, see: Koonalda Cave Art (18,000 BCE). While the aborigine engravers were making the first petroglyphs on the Burrup Peninsula, the oldest Stone Age art in Europe was being made in caves and rock shelters. The El Castillo Cave paintings, for instance, are dated to 39,000 BCE. However, Europe's oldest art is fairly primitive - it isn't until 30,000 BCE that we see the magnificent lions and horses depicted in the Chauvet Cave paintings, and not until about 15,000 BCE that we see the wonderful bulls in the Lascaux Cave paintings and the multi-coloured bison at Altamira.  For more about arts and crafts of the South Pacific, see: Oceanic Art.  For more about the traditional art of indigenous natives, see: Tribal Art.  For more about engravings in the Burrup Peninsula and Dampier Archipelago, see: Homepage.